Hi everyone and happy 2014! I hope yours is off to a great start! I'm starting the new year off with a photo and sentiment that I have been meaning to scrapbook for awhile. This photo is from Thanksgiving Day. To my little guy, 100 is the biggest number ever, an infinitesimal amount. Like the characters in the children's classic, Guess How Much I Love You, my son and I try to outdo each other in our expressions of love. 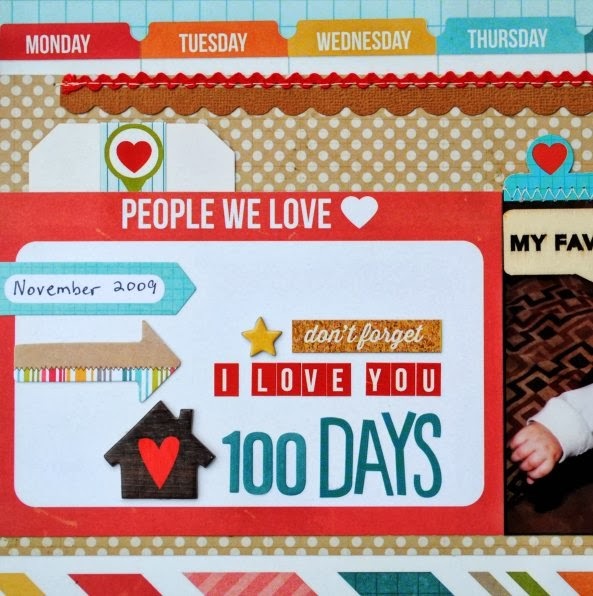 One night, my little boy came up with the expression: I love you 100 days! It was perfect. We say that to each other all the time now and I wanted to be sure to document it in his scrapbook. For this layout, I used the Daily Grind line from Simple Stories. 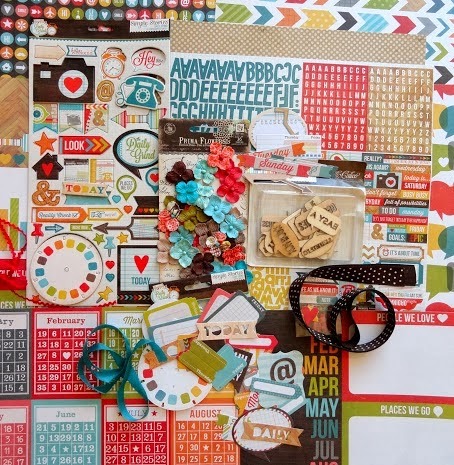 The collection was including in the January Creative Kit at My Creative Scrapbook. The kit is pictured above. It was a super fun one to work with. I will have more layouts from this kit on my blog this week. Thanks for stopping by! Adorable! I love the colors and the sentiment. A wonderful thing to scrap. This is gorgeous! LOVING the colors and that sweet photo!!!! Such a sweet memory to document Izzy!! And I love what you did with the kit!! That page is adorable - super cute touches you have used. I picked up a couple pieces of that collection as well, can't wait to use them. Darling layout! Such a great kit, just love it! Hi Izzy! Thank you so much for visiting my blog! I was happy to see your wonderful comment there. And I absolutely love this adorable and precious page you made! The photo is wonderful and your design using this collection is awesome, as always, my friend. I'm not sure what's more cute... that photo or that page you created! Both ADORABLE!